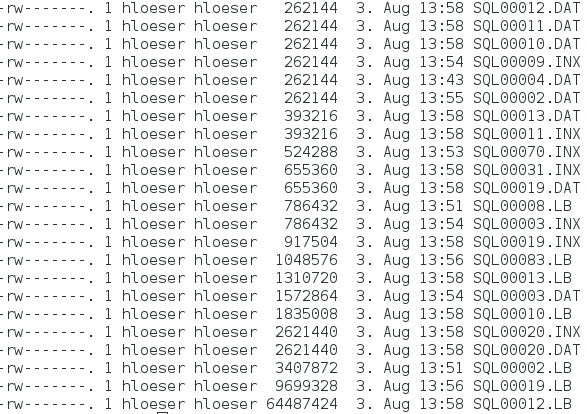 Last month, after receiving user questions, I blogged about how to decipher Cloud Foundry log entries. 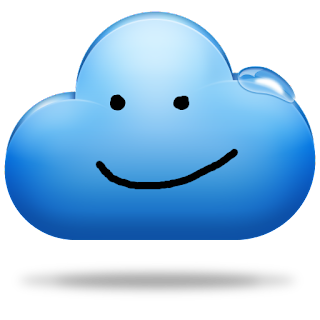 Today, I want to point you to a small Cloud Foundry Python app I wrote. It helps to better understand Python and Cloud Foundry logging. 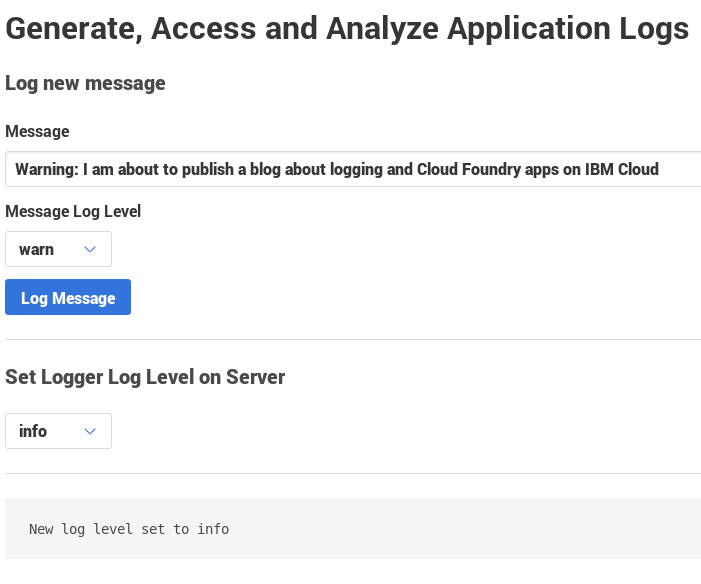 You can also use it to test the IBM Cloud Log Analysis service which provides an easy-to-use interface to logs generated by applications running in the IBM Cloud. In the premium plans, external log events can also be fed into the service for consolidated storage and analysis. 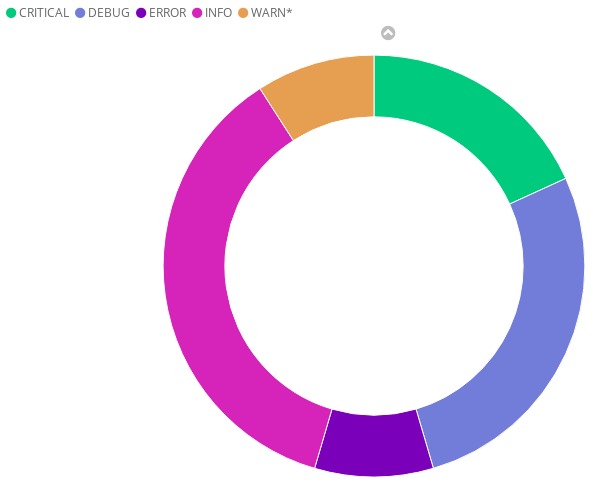 The produced log entries can also be used to try out the IBM Cloud Log Analysis service. Diagnostic logs are automatically forwarded to the Log Search of that service. The messages are fed into Elasticsearch and can be analyzed using Kibana. I wrote some search queries (one shown below) and then built visualizations like the shown "Donut" based on those queries. I will write more about that in a future blog post. 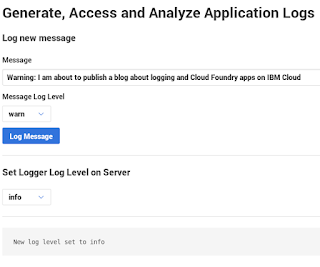 An official tutorial using that app and Log Analysis is available in the IBM Cloud docs. IBM Cloud is the new name for the former IBM Bluemix offering. It combines the Platform- (PaaS), Infrastructure- (IaaS), Function- (FaaS) and Software-as-a-Service (SaaS) offerings under the new, simple name: "The IBM Cloud is the cloud for the enterprise. Yours." IBM announced the roll-out of a new support model and enhanced capabilities for IBM Cloud, giving clients full control over their data. Support will be provided be EU-based staff. 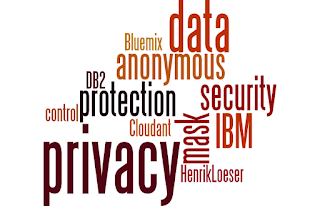 A new, enhanced version of IBM Cloud Private is available. It allows to run Kubernetes-based containers, Cloud Foundry apps and much more in your data center and enables the journey to cloud. A new IBM Cloud support portal has been made available. It serves as a single entry point for anything related to the cloud services, regardless whether it is public, dedicated or private cloud. 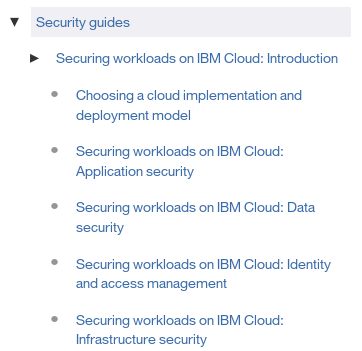 A new tutorial section has been introduced in the documentation for IBM Cloud. They help developers get to know services and tools together to build, deploy and scale real world solutions. Read more about the tutorials in this blog. Over the past years I have written a couple cloud-based apps. Most of them have a database backened. I know - to a good degree - how to secure the database system. I have some background in secure software engineering. And I trust the cloud providers like IBM to secure the platform and runtime environment. 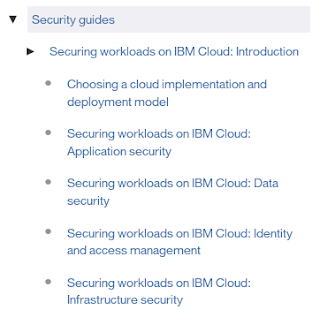 Today, I wanted to get feedback on the overall web app security and tested the Application Security on Cloud service offered in the IBM Cloud Platform. Here is what I did and the results. Db2 Warehouse recently added a new feature named external table. 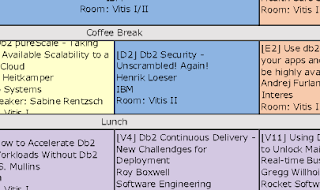 Because I was interested in that feature for a while and I have an instance of Db2 Warehouse on Cloud running in the IBM Cloud datacenter in Frankfurt, Germany, I performed some quick tests. Here is what it is and how I got it to work. More and more chatbots are being developed and there are good reasons for it. Not all chatbot projects succeed. Often, missing user acceptance is stated. 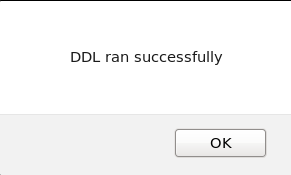 The dialog system might not have hit the nerve, might not have fitted into the target environment. Would you talk with a friend who does not remember your name is repeating the same five phrases over and over again? I would not. So what can be done to make chatbots more lively, more human-like? 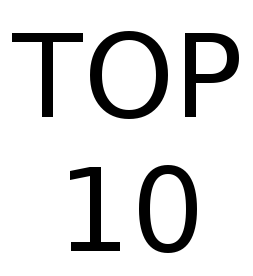 Here are some best practices and ideas on how to implement them. I started my series on chatbots with lessons and tips from a chatbot hackathon. In that blog I focused on general aspects of building dialogs and designing a conversation system. The language needs to fit the audience. It is something we will look at again today. In a recent blog post I shared tips and tricks for building chatbots. It is possible to carry context throughout a conversation and embed conditions and advanced expressions into the dialog flow and single reponses. We will use that to implement some of the best practices found below. Building lively chatbots could also mean to give the bot a face. 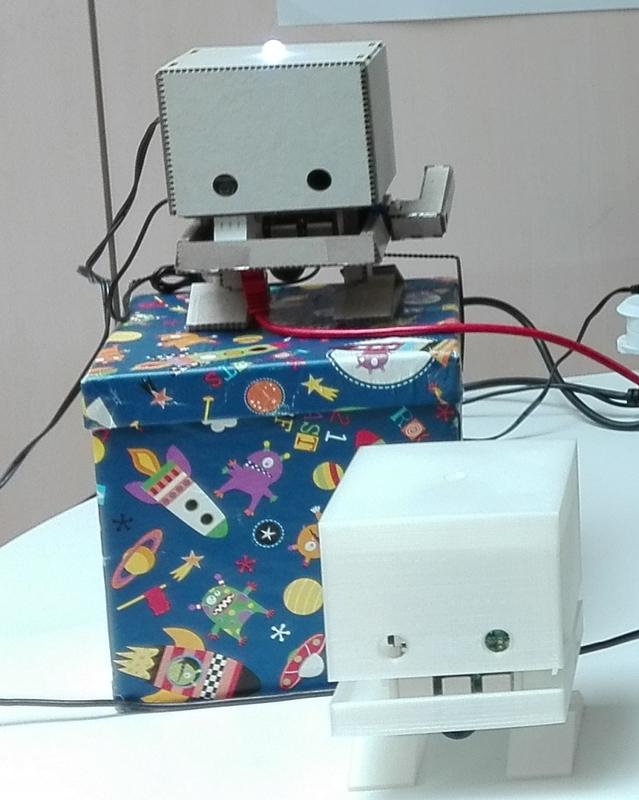 The open source project TJBot (pictured) is an example for that. The TJBot can listen, speak and see, give additional feedback and interact through its arm and its light. We won’t cover those aspects, e.g., hardware design or user interfaces, in this blog entry. Today's blog entry is about an old topic: Who I am, why I am and what I am (allowed) to do? 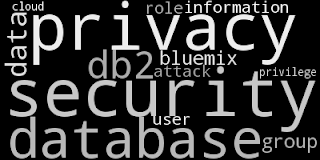 Users and their privileges are at the core of database security. Information about them are stored in the IBM DB2 catalog (or IBM ashDB catalog) which can be queried. Thus, it is good to know your way around and being able to extract that information. Kind of as a reference for myself, here is a summary. In 2012, I gave an introduction about where to find granted privileges in the catalog. It covers the catalog structure and links to key tables. In 2011, 2013 and recently, I discussed trusted contexts, surrogates and the session user as special form of granting privileges and switching identities. I started with a short explaination of trusted context. Next, this introduction covers the concept of surrogates and switching the userid via SET SESSIONUSER. As a follow-up, I looked into related catalog entries for trusted contexts and surrogates which are related to the task scheduler. Last year, I wrote about interesting administrative views and and table functions to list privileges. As an example I looked at implicit privileges through group membership. 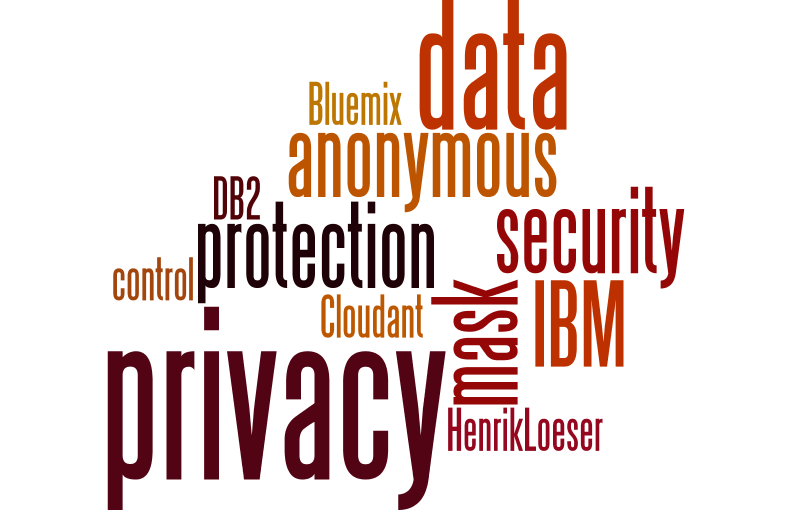 The DB2 Knowledge Center provides a list of security-related views and routines. The same resource also has a discussion about gaining access to data through indirect means. It lists the catalog tables, but then many more options on how possibly data and related privileges can be accessed. Over the past day and evening I had some fun with a slightly mutating chatbot. 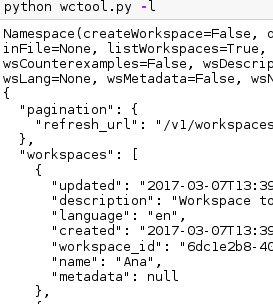 The API for the IBM Watson Conversation service offers REST calls to query and change the workspace, the parts that make up a chat. 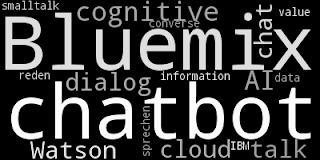 So why not try writing a chatbot that is egocentric? A chatbot that answers questions about itself, that is happy as long as everything is related to itself? Well, let me tell you about this fun project I call EgoBot. The EgoBot is at an early stage right now. It supports queries about some of its metadata and adding new intents. And it has both an English and a German version (does language change its character...?). You can see a sample session below. To find out more about this chatbot head over to the EgoBot GitHub repository. The bot is written in Python and has everything to get you started with either an English or German conversation. Let me know about your Friday fun. You probably know that CLI stands for Command Line Interface. And you are aware that IBM Bluemix and Cloud Foundry offer a CLIs. Did you know that you can manage service keys from the command line? Adding new credentials, obtaining keys, and deleting service entries is really simple and fast. 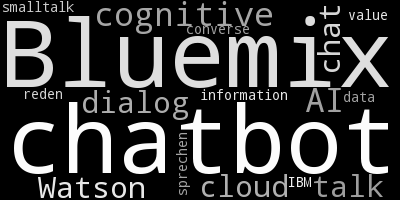 In the following, I will show you the commands and use my chatbot project and the IBM Watson Conversation service on Bluemix as example. 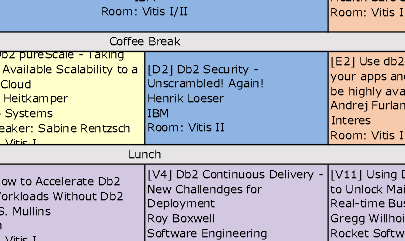 And I will be using Bluemix in Frankfurt, Germany. So brace yourself for a quick tour through managing service keys from the command line. With IBM Bluemix Cloud Foundry you have the choice of using either the Cloud Foundry CLI (“cf”) or the Bluemix CLI (“bluemix” or “bx”). The “bx” command has an option for the “cf” commands. 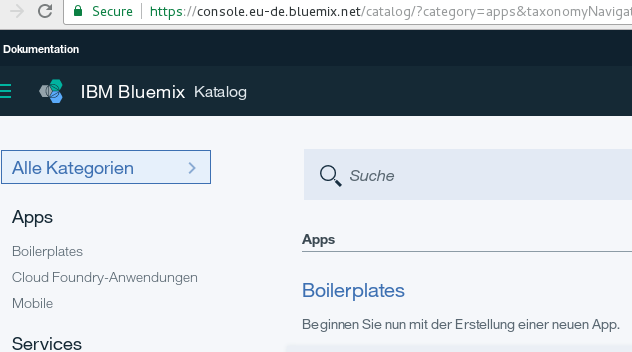 Both CLIs can be downloaded from the same page in the Bluemix documentation. The CLIs have many options to manage apps, services, organizations, spaces, and much more. Both can also be extended through plugins. You can even write and integrate your own plugins. I would recommend using the Bluemix CLI because it offers more features, including a handy option to update itself. For the example I am going to use the Cloud Foundry CLI to demonstrate the general case. 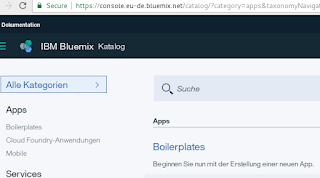 Bluemix offers many services, big and small, in its catalog. Most of those service can be used by more than just a single user, a single app, and not just from within Bluemix. Therefore, creating several credentials for a service, so-called service keys, is essential to consuming a service. The keys can be managed from the browser-based Bluemix console or on the command line via CLI. I chose the name “Conv-DE-user2” for the service key. Let’s see if it was added. Existing service keys can be deleted with the “delete-service-key” or “dsk” command. Recreating keys is one way of implementing rotating passwords (credentials). As shown above, it is pretty simple to manage service keys from the command line.Both the Bluemix and Cloud Foundry CLIs can be used. But not only the credentials can be administrated from the command line. Create services, bind them to apps, request billing and usage information, and more. And, as mentioned above, you can even extend the functionality through plugins and create your own.